I have no idea what this book was going to be. The Art of the Video Game. Video gaming has come such a long way and there must be a million things and games that can be written about it. I used to play the Sega, Super Nintendo and Playstation at my friends' house. Looking back, I can see how addictive gaming is to kids. Parents today have a tougher job prying their kids away from computer games. 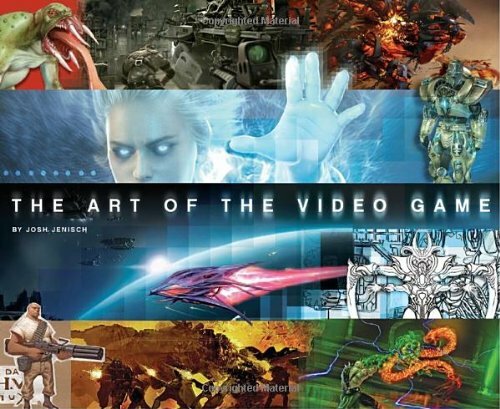 The Art of the Video Game starts off with a very nice brief history into the evolution of video game. It goes through every possible gaming platform from the room-size mainframes, to the death of Sega Dreamcast, to today's current fight between Wii, Xbox 360 and the Playstation 3. It's like a blast from the past, something nostalgia for gamers to read about. Of course not every game can be included. The writeup for each game talks about the background development of these games. There are plenty of interesting things to read like how Lara Croft ridiculous proportions have to be scaled back, or making sure that churches are not modeled after real life ones if you're planning of letting gamers blow them up. The art for each games consists of screenshots and some concept art, both with equal weightage. While I can't say there are a lot for each game, for the whole book, there are plenty. My favourite game art is Team Fortress 2. I just love the stylized characters and the colour palette. I hope they will release a dedicated art book for that game one day. This book is recommended for game and concept artists. Team Fortress 2's character really have strong silhouette design for different classes no matter which angle they are facing. That's what I like about the game! I do hope they release an art book based on just TF2 alone too.